Dork Tower and Dr. Blink Comic Books, You Ask? A couple of years ago, I stopped publishing comics. * Our Siberian adoption fell through. The beautiful baby girl we flew to Chelyabinsk to meet would never be ours, due to international politics. * Apples to Apples — a game I was closely associated with for 10 years — was sold to Mattel. * My hilarious, wonderful, larger-than-life father-in-law died. * We discovered Judith was pregnant. And it was a high-risk pregnancy. If you’d seen me at a convention before then, you’d most likely have noticed I looked exhausted. I was worn out, but having fun. Out of the Box Games; Dork Storm Press; Dork Tower; Dr. Blink; SnapDragons; Munchkin; success, success, success, success; yadda, yadda, yadda, yadda. All of a sudden, over the course of 12 months, life became a lot more serious, and spending more time – MUCH more time – with my family suddenly seemed like a good idea. I had to drop something. And that something was self-publishing. Now, I’m proud of what I accomplished as a publisher. 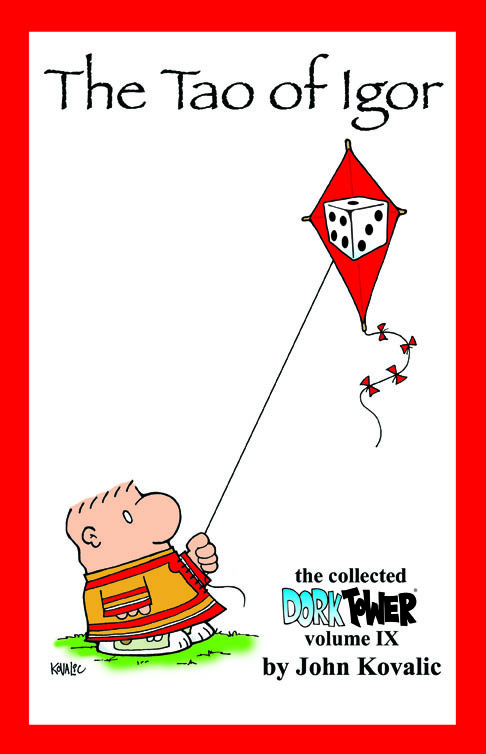 75,000 copies of the Dork Tower collections is nothing to sneeze at. Sales of the individual comics was in the hundreds of thousands. Including special promo issues, it was darned near half a million. But, of all the aspects of my work, it was the one that just wasn’t fun anymore. Printers; sales folk; advertisers; distributors; conventions; translations – my head would spin. Also, I’d find myself making the same little mistakes month in and month out. How many times COULD I mess up an ISBN number, anyway? Don’t ask. The writing and drawing was still a joy. But the business side was stressful, and most definitely not fun anymore. So, when something had to give, the choice was obvious. To me, anyway. Today? Well, let me tell you what I’m doing today. I’m at a coffee shop with free WiFi, havng a spot of breakfst having just dropped my beautiful daughter – 20 months old, with her dadda rapped around her tiny little finger, thanks for asking – off at daycare. I’m on my way to our old house. The old house is a great place to write. Yes, I still adore the downtown studio, for drawing and painting. But the old house is out of internet access, away from any distractions, and just a solid, relaxing spot to bang out words. The words I am currently banging out are the finale of “The Tao of Igor.” I’ve about 20 or 30 pages to go. This may or may not be released as a comic book (the long-awaited Dork Tower #37), it may or may not be released as a PDF download, but the “Tao” collection itself should be out by Spring 2011. Concurrent with this, the original Dork Tower collections will be re-solicited for the first time in three years. All nine of them, starting with the first three, and then three a month for the next two months. These should be available by Christmas. Then it’s on to new Dork Tower and Dr. Blink comics. The pretense of a bimonthly schedule is something I think I just don’t want to deal with anymore. So the plan is to release four- or five-issue mini-series of each, on a roughly annual basis. Individual issues in the mini-series would then probably be released on consecutive months. And I wouldn’t want to release the first issues until the last issues were DONE. Chris Jones already has some scripts for Dr. Blink shorts in his talented hands. I have the next mini-series plotted out, and a couple of the issues are almost finished. I have an idea for the next Dork Tower story arc. I’m fleshing it out now. SnapDragons will return, too, as a backup in Dork Tower, and possible special issues. More importantly (for now), Liz Rathke and her sister Susan are working on a brand-new SnapDragons graphic novel. I’m helping on this as time permits, mostly editing, plotting and a touch of writing, but honestly it’s looking absolutely superb WITHOUT my help. So prolly best to keep my hands off this and not screw it up. Grin. I’ve been talking with some publishers – yes, REAL publishers – and I’m liking what I’m hearing. But even if I choose not to go with an honest-to-goodness actual Real, Legitimate, Lrge Publisher, there will still be Dork Tower, Dr. Blink and SnapDragons comic books and graphic novels. Self-publishing may be annoying, but it’s not hard. Really. Nothing is set in stone at this point. have a thousand ideas, and need to weed the good ones from the bad. However, I just didn’t want to wait any longer. So I’m going to the old house. And to absolutely everybody out there – I’m deeply, DEEPLY sorry for the wait.